The enemy wants believers to deny their Kingdom because of its power. If you stand for Kingdom, and stand on the word of your King (Jesus), everything around you must alter and align itself to Kingdom laws, principles and culture. In this series you will learn: 1. Satan is a negotiator and he wants you settle for less than what God has promised you. 2. The boundaries in your life must be removed by the word of God and by faith. 3. God has kept records of all injustices and He will make the enemy pay recompense, and much more! You can do things the world cannot do. Jesus preached the Kingdom and than manifested it by healing the sick, raising the dead, and walking on water. He told the disciples to feed 5,000 men plus women and children. Why? Because they had no boundaries. The enemy's job is to keep those boundaries in place, but you can breakthrough by faith! 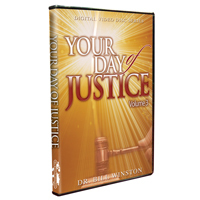 This is you set time...Your Day for Justice.